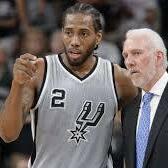 Ric Bucher (@RicBucher), longtime NBA Insider with SiriusXM Radio and Bleacher Report, joins us to discuss NBA topics including the fractured relationship between the San Antonio Spurs and their superstar player Kawhi Leonard, the future of the Oklahoma City Thunder and LeBron James' future plans. Ric also helps Brian Berger preview the upcoming Sports PR Summit on May 22 at The Players' Tribune in New York City. Bucher will conduct a Featured Conversation at the event with former NFL QB Michael Vick and Berger will conduct a Featured Conversation with NBA Head Coach David Fizdale at the Sports PR Summit. Caley Wilson, Co-Founder of Blinder (@BlinderHQ) joins the show to discuss his company's innovative new technology. Brian Berger and Bryan Griggs discuss the NFL Draft and give you the total audience numbers, thoughts on best and worst draft picks and which rookies have the top selling jerseys post draft.